Tamsin Nottage and Iko Iko prepare to enter the show ring at HITS-on-the-Hudson. Bahamian equestrian athletes continue to shine abroad! 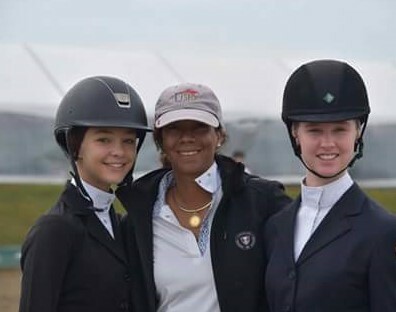 This past weekend, young Bahamian riders Ella Holowesko, Siena Holowesko, and Tamsin Nottage travelled to Saugerties, New York, with their trainer, Mrs. Erika Adderley-Coello of Mariposa Stables, to compete at the Marshall & Sterling Insurance League 2016 National Finals. All three athletes rode very well, but undoubtedly the highlight of the weekend was Ella Holowesko’s victory over a field of 60 riders in the 3’0” Sore No-More Children’s Medal Final. points that will earn them a place at the prestigious National Finals competition, held each September at the world-class HITS-on-the-Hudson show grounds in Saugerties, New York. 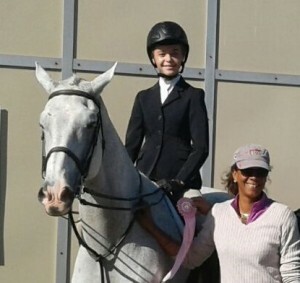 Siena Holowesko won 5th place in the Hudson 2’ 6” Children’s Equitation Classic. At right is her trainer Erika Adderley-Coello. 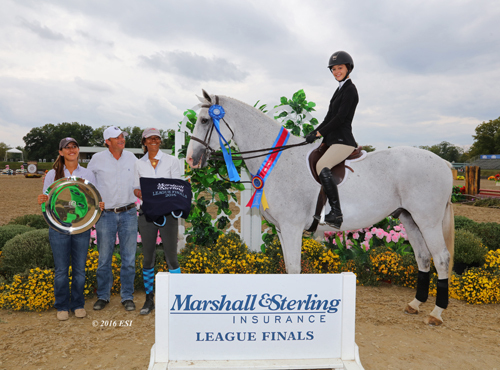 By virtue of their qualifying points accumulated in local competitions throughout the year, the three riders were invited by the Marshall & Sterling Insurance League to compete as Finalists in their respective events. Siena Holowesko qualified as a Finalist in the 2’6” Children’s Medal, while Tamsin Nottage and Ella Holowesko qualified as Finalists in the 3’0” Sore No-More Children’s Medal. The competition began on Friday, September 16, as all three rode in preparatory classes. Siena Holowesko was the first to compete, riding Veronica Mullin’s talented horse Keating’s Lord, and placing 5th in the Hudson 2’6” Children’s Equitation Classic. On Saturday, her sister Ella followed suit by placing second in the Hudson Children’s Equitation Classic 3’ (Section B). It was in the Medal Finals, however, that the riders would truly be tested, as they faced a challenging course designed by Rian Beals. Once again Siena was the first to compete, riding against 54 other young competitors, all hoping to take home the Marshall & Sterling Children’s Medal Final title. She placed 34th out of the group of 54 with a very respectable score of 61.5 (out of 100). In the 3’0” Sore No-More Children’s Medal Final, Tamsin Nottage and Ella Holowesko faced an even tougher challenge against a talented and competitive field of 60 riders. Riding the chestnut gelding Iko Iko, Nottage had a stylish round, but due to a few unfortunate mistakes ended up with a score of 51. It was Holowesko, however, who stole the show. Riding Keating’s Lord, she rode with elegance and flair, earning a first round score of 86. This excellent score qualified her to move forward into the final round, where she stood in second place just one point behind the leader, Annie Walsh, riding Erosmith. After a reset of the course the top 12 finishers rode another round, and in the end consistency was the key to victory: Holowesko scored 85 in her final round, which combined with her first round score gave her the winning total of 171.00! Walsh’s second round score was 80, enough to secure second place. The top five finishers all scored in the mid to high eighties, highlighting Holowesko’s tremendous accomplishment in scoring the winning round.